We rode Trollstigen Road- possibly the BEST road in Norway- and it was AMAZING. Heck- we even got sunshine! I'll be honest, one of the driving (ha- see what I did there!) forces for us taking the motorbikes to Norway was so we could ride Trollstigen road on a motorbike. And oh man was it worth it!! This is one of the most fun roads we've ever visited and whether you do it by motorbike, motorhome, car, campervan or even bicycle (why, crazy person?? Just WHY??) we absolutely guarantee you'll be glad you added Trollstigen Road into your Norwegian itinerary. Where is Trollstigen Road in Norway? What is Trollstigen Road and why is it the Best Biker Road in Norway? 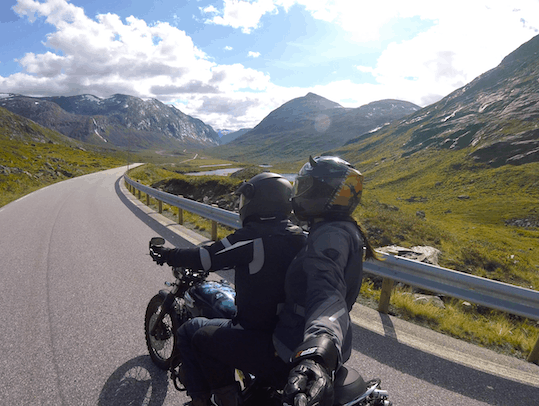 Watch the video of us riding Trollstigen Road on a Motorbike! Can you drive Trollstigen Road in a Motorhome or other vehicle? Can you ride Trollstigen Road on a Motorbike? Is it worth the effort of taking a motorbike to Trollstigen Road? Where to stay when you visit Trollstigen Road? How to get to Trollstigen road by vehicle? How much does Trollstigen road cost? Would you go back to Trollstigen Road on a Motorbike? It's a series of hairpin bends (apparently there are 11 but we didn't stop to count them!) which are built into the side of a mountain. The scenery is breathtaking… but don't take your eyes off the road for too long!! It's one of the 24 most dangerous roads in the world! It isn't open all year round- exact timings depend on the weather (or snow to be precise!) but it's roughly open from May until November. PLEASE check in advance if you're going in snow season or you'll be disappointed. This site should be able to tell you. It takes 9 minutes to go up (or down- possibly more in a motorhome as you'd need to stop more often.) We rode up and down a few times- there's a parking area at the bottom to turn around in and at the top is a rest area with a cafe, gift shop, toilets and 2 viewing platforms. The second viewing platform is suspended out into the valley, ABOVE Trollstigen road… it gives incredible views of the vehicles on the road below. Want to see what Trollstigen road is like on a motorbike? (Or in a Motorhome- there's plenty of footage of vans of all shapes driving the craziest road in Norway!!) And you can see what I mean about the lorries- phew! Glad I'm not driving one of those up there!!! Absolutely… but in my experience I'm glad we did it on a motorbike. Our motorhome is 7.5m long and you can definitely drive the road with that… although take your time and wait for cars to stop- as you can see in the video below it can get VERY tight! However, if you're much longer or if you tow a trailer like us, I would suggest another mode of transport as the turns are really tight. Lorries and coaches do go up & down it but they take up the entire road and they don't stop for anyone! I guess it depends on how confident you are and also what time of day/ year it is. We did it during August, in the middle of the afternoon. It was BUSY! Oh heck yes. It's awesome. I've always said the road in Italy was my favourite ever biking road (so far! )- but Trollstigen may just be the new champion. I'm afraid the Black Forest in Germany, whilst pretty and fun, doesn't even come close! This was a huge discussion point for us. Even before we knew that the weather was going to be rotten (or ‘normal summer' as the Norwegians call it! ), we knew that taking a trailer was drastically going to increase the cost of the trip. From the price of the Eurotunnel, the price of the ferry to Norway from Denmark, ferries in Norway, toll fees… all of it costs more with a trailer, not to mention the fuel costs of towing half a tonne behind the motorhome each day. But the thought of being able to explore on our bikes was just too strong. And to answer the question- yes, absolutely it was worth riding Trollstigen road on a motorbike. It was one of the highlights of our trip! The rest of the 63 is also pretty spectacular! Trollstigen Road – it really is Norway's crazy road!! If you don't like heights or tight, twisty roads with not enough space for two cars to pass then yep, you're probably going to be scared. I love heights but not when I might be run off the edge of a cliff… so if we'd been driving in the motorhome we'd have visited much later in the day when the tour buses and coaches had finished and the road is a lot easier to drive. Sunrise is also a good time apparently. I wouldn't want to drive it in the rain or in the dark… that would be terrifying!! The closest ‘big' place to stay near Trollstigen is Andalsnes. There's also Trollstigen campsite here which has space for motorhomes/ campervans, tents and also some chalets to rent. The views are INCREDIBLE!! To be fair, anywhere around Andalsnes is going to give you incredible views!! We stayed a little further away in Stordal, in a free camping place. This suited us at it was free (yay!) and was a safe place to leave the motorhome whilst we went exploring on the bikes. Often we book into a campsite to do this, just to guarantee the security of all our stuff, but Norway is incredibly safe and there were lots of friendly looking people around, so we took a chance and stayed there. It was so nice we actually stayed for two nights! It was about an hour ride to Trollstigen from Stordal- but the roads are so pretty it didn't matter at all! If you don't have your own vehicle to explore, I would definitely suggest hiring one so you can drive Trollstigen for yourself… although doing it in a coach as part of a tour might be terrifying too!! You can hire a car from one of Europcar's many locations, including Molde, which is less than 2 hours by car from Trollstigen. Click below to check our their incredible deals! Route 63 isn't a toll road, so you can drive Trollstigen for free as many times as you like! But I'd highly recommend a stop at the gift shop for overpriced souvenirs of your adventure- and a piece of delicious carrot cake. Seriously, that cake was worth the trip to Norway alone!!! Unbelievably, I didn't take a photo of it… guess I'll just have to go back!! A little further south of Trollstigen on the 63 is Gudbrandsjuvet waterfall. There's a chance that by now you're a bit ‘waterfalled-out' as Mr WB calls it, and I agree that Norway has an incredible amount of waterfalls… but this one is pretty impressive and free to view- we do love Norway! The river tries to squeeze itself through a narrow gorge, causing it to froth and swirl into a boiling frenzy- it's a majestic sight to see! There's also a cafe here and it's a pleasant place to stop for a picnic. Yes, yes, yes and yes. Especially if we could guarantee the weather. That's the trouble with Norway- nothing is guaranteed and the unpredictable weather can be quite draining. But yes- we'll definitely bring the bikes again when we go back to Norway! Great video of the Trollstigen Road looks like you are having a great adventure. Hi Kevin! We used to use an osmo- but it doesn’t work with the latest iphone- booooooo. This was filmed using a GoPro without a stabiliser- I was pleased it wasn’t shaky!! Never done it before! Do you ride? ?